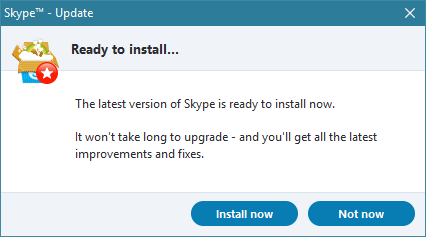 If you are still running the desktop version of Skype on a Windows 10 computer, be careful before you click “Install now” when the Skype Update dialog appears on your screen. You see, “the latest version of Skype” that is ready to install is the crappy, worthless, dysfunctional “Metro” version of Skype, which now Microsoft is keen on pushing out to unsuspecting customers, who may naively think that this update, like so many updates before it, is merely another security and functionality fix. It is not possible to change incoming call notifications, which currently interrupt whatever the hell you might have been doing, stealing focus. It is not possible to tell Skype 8 to use your desktop speaker for incoming call rings, when you are using an earpiece for the actual call. The “Metro” UI is buggy. By way of a rather blatant example, when I call a landline contact in Hungary (+36 country code, 1 for Budapest), once the call connects, it shows up in the UI as a call to +1 361 … Needless to say, any attempt to redial fails. Other “by design” annoyances in the UI, for instance, when there is an incoming message or call that I do not answer, I get a notification in the Chat tab, but the contact is not brought to the top of the list; I have to scroll down manually, hoping that I do not accidentally skip over the contact that appears in boldface. Though I do not use it, many do: apparently Skype 8 is not integrated with callto: links on Web pages. In short, the new UI offers a much poorer user experience, it has serious functional deficiencies, and it is buggy. What I would like to know is what on Earth is going on in the heads of those at Microsoft who are pushing this “upgrade”. 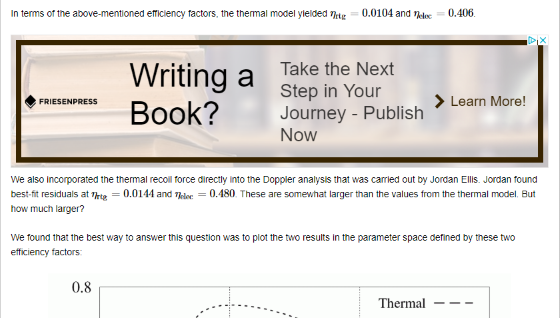 And who is going to give me back the hours that I wasted on this boneheaded nonsense. At least for now, it is still possible to reinstall Desktop Skype by following the direct download link. Just be sure not to “upgrade” by accident afterwards. Imagine a health care system that is created and managed without the help of doctors. Imagine getting radiation treatment without the help of medical physicists. Imagine an education system that is created and managed without educators. Imagine a system of highways and railways created and managed without transportation engineers. Imagine an electrical infrastructure that is created and managed without electrical engineers. 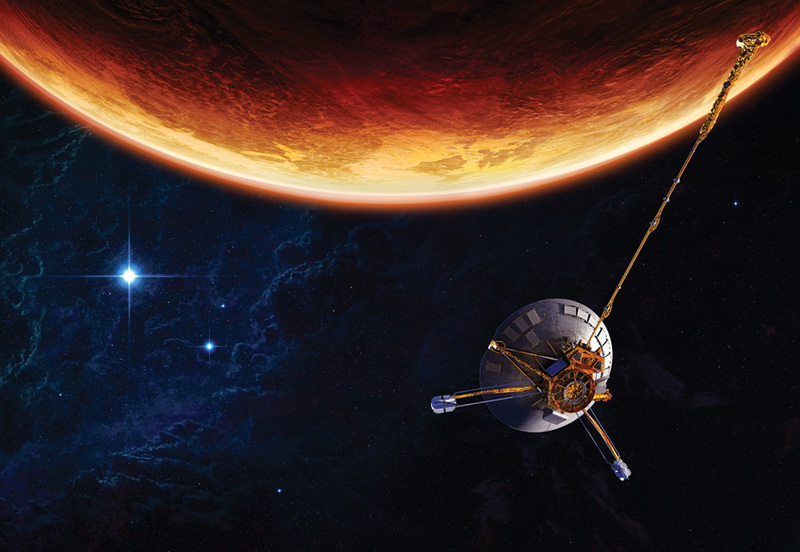 Nuclear power plants without physicists. An economy that is managed without professional economists. A communications infrastructure created and managed without radio engineers, software and network engineers. 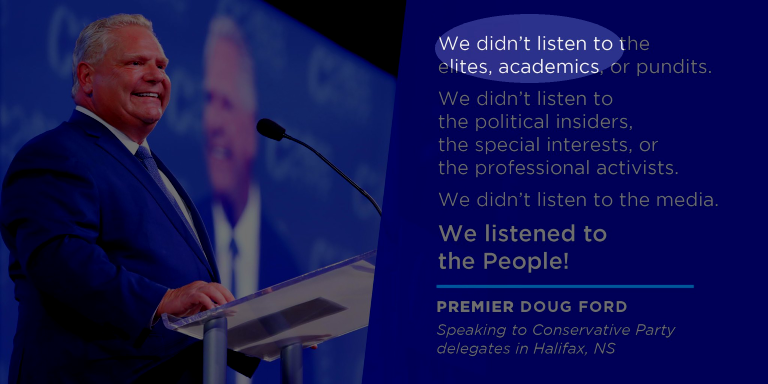 This is Doug Ford’s vision for the province of Ontario, presented by none other than Doug Ford himself through his Twitter feed, as he proudly proclaims that his government, his party, won’t listen to academics: the very people that we pay so that they learn and offer their professional knowledge for the benefit of the public. I often advise my clients that although automation is great, it must be accompanied by well-tested fallback procedures and training, to ensure that they can continue operations even when systems fail. This is especially important in the case of life-critical applications or, for that matter, in applications related to major centers transportation and infrastructure centers. Today, there was a perfect example that took place at Gatwick Airport in London. Due to a problem with an underground cable, their flight information system failed. That meant no more functioning displays showing departure times and gate numbers. Yet the airport was able to continue operations with no cancellations or delays, and with very few passengers missing connecting flights. How? Why, they used whiteboards. Yes. Whiteboards, maintained by officials carrying walkie-talkies. This is exactly what “business continuity” means. 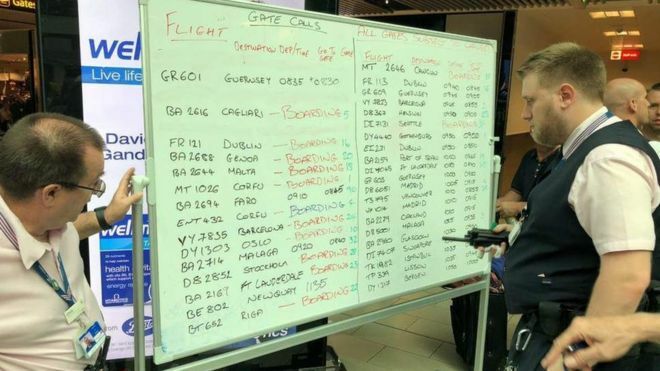 I hope that the person at Gatwick who insisted that such plans must be in place and ensured that not just whiteboards, walkie-talkies and markers but also adequately trained personnel were available when needed, will get not just a commendation but a nice raise. Over the years, I ended up with several Microsoft accounts, and it is a mess. Here is how it happened. I had a Microsoft account since time immemorial, associated with my personal e-mail. I had my MSDN subscription under this account. I also had a Hotmail account since time immemorial. I had a Skype account since time immemorial, too, associated with my personal e-mail. I used my standard, preferred username as my Skype name. The Hotmail account became an Outlook account once Microsoft acquired Hotmail and created outlook.com. Thus, this became a separate Microsoft account. My standard, preferred username became a Microsoft Live ID. So here is what I wanted to do at one point: I wanted to use my personal e-mail as my Office 365 and SharePoint online login. But for reasons I no longer remember, there were obstacles along the way. To resolve this problem, I first moved my MSDN subscription to my Outlook account. 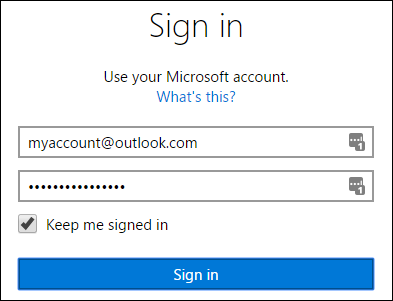 I then changed my old Microsoft account to be identified not by my personal e-mail but by my Gmail address. This freed up my personal e-mail address to be used as an Office 365/SharePoint online user account. But then, one day when I was trying to use Windows 10 Quick Assist to offer assistance to someone, the software told me that I need not only to log on to Microsoft, but associate my account with my Skype account. OK, I’ll bite the bullet, I said… and associated my original Microsoft account (now under my Gmail address) with Skype. And now I am having a problem. Skype tells me that my account has two aliases: The Gmail address and my standard username. But if anyone sends a contact request to my standard username, I get nothing. Today, I figured out why: these requests go to my other Microsoft account! (The one I never used with Skype.) Presumably it’s because my standard username also happens to be my Microsoft Live ID. Needless to say, there is no option to merge two Microsoft accounts. There is no option to unmerge a Microsoft account and a Skype account either. I cannot even add my old personal e-mail address as an alias to either of my Microsoft account; presumable because it is now set up as my Office 365/SharePoint online user account, I receive an error message indicating that a “work or school” e-mail cannot be an alias. As a reminder to myself, here is an excellent page that explains the difference between Microsoft and Office 365 accounts.